We have a small storage room at Studio D, and the topic came up about having the random white door in the middle of our cool new studio. So I suggested, why don’t we decal it? Help me choose! Which door decal should we choose? The TARDIS from Dr. Who? 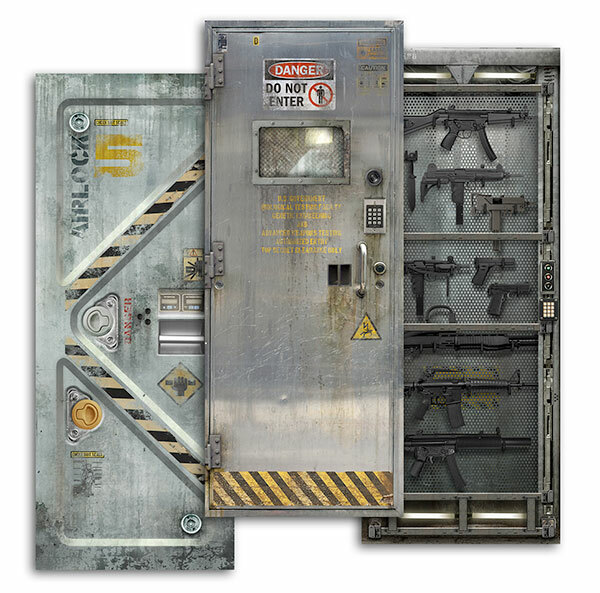 Or one of these awesome sci-fi inspired door coverings? We wouldn’t go with the gun one … just doesn’t suit our family-friendly style. Which of the 3 would you like us to go with? Which Door Decal Should We Choose? 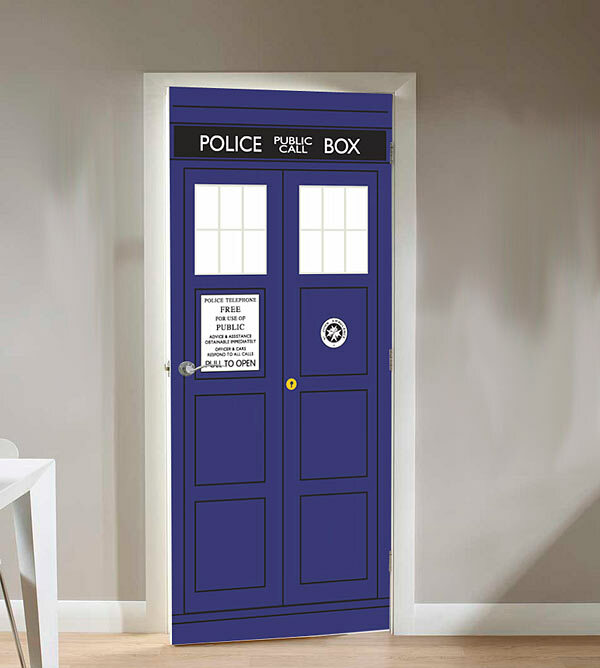 I am pleased to announce that the storage room door will lead to a room that is much bigger on the inside! TARDIS it is! Thanks for your feedback. Hillary stopped in while I was at work to give us a good jump on the ceiling tiles! They’re looking great with a little primer on them. It’s going to really brighten up the place. I also got to install my first-ever piece of drywall. I know: Christa and Brad already pre-cut it to size for me, but it was still an accomplishment! I’ve got to admit, I was getting really worn out, and just knew I had mudding to do. So I got rocking on the mud, and kept pressing on, but was feeling a little like I was marching up hill while pushing a train full of bowling balls. But then, Christa and Brad showed up unexpectedly to review my work, and to put up the “more complicated” drywall which I would not be able to do. I really felt like that gave me my second wind: to be reminded in that moment that I was not doing this alone… that I have friends, viewers, and supporters who are right here with me. No matter how tiring this gets, I’m pressing on! Some days I just don’t have the time to stay at Studio D for hours on end, but I still want to get things done. Day 22 is one of those days. The landlord visited the night before (I didn’t have the camera with me, nor would it have made exciting video) to simply turn off the power to the wall receptacles, so on Day 22 I could safely replace the outlet which Paulo had discovered to be rusted out, having been filled and drained of rainwater many times through the years. Okay, so people told me all about how dusty sanding drywall mud is, but why did nobody mention how much work it is? That was brutal! I spent several hours sanding the mud by hand, and figured out a way to speed it up by being slightly less… you know… picky (I’m an extreme perfectionist with all I do). I was feeling really encouraged when the rain poured down but the studio was still dry, but then the rain started working its way into the studio as well. My heart sank a little at that point, but I’m pressing on and trusting and believing this is all going to come together beautifully. No time to dwell on it just yet. I’m doing pretty well, but finding the days long and tiring. I can’t wait to move everything in and get to the point where the studio is just a studio.